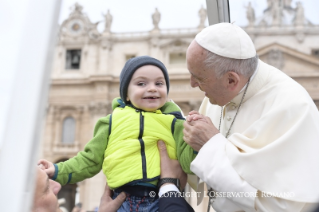 This morning’s General Audience was held at 9:25 in St. Peter’s Square, where the Holy Father Francis met with groups of pilgrims and faithful from Italy and from all over the world. Continuing with the catechesis on the Holy Mass, in his address in Italian the Pope focused his meditation on the Eucharistic Liturgy: III “Our Father “ and breaking of the Bread. And so we begin the rites of Communion, prolonging the praise and supplication of the Eucharistic Prayer with the communal recitation of the “Our Father.” This isn’t one of the many Christian prayers, but the prayer of the children of God; it’s the great prayer that Jesus taught us. In fact, consigned to us in the day of our Baptism, the “Our Father” makes resound in us the same sentiments that were in Christ Jesus. When we pray the “Our Father,” we pray as Jesus prayed. It’s the prayer that Jesus did, and He taught it to us, when the disciples said to him: “Master, teach us to pray as you pray.” And Jesus prayed thus. It’s so good to pray like Jesus! Formed to His divine teaching, we dare to address God calling Him “Father,” because we are reborn as His children through water and the Holy Spirit (Cf. Ephesians 1:5). No one, in truth, would be able to call Him familiarly “Abba”—“Father” — without being generated by God, without the inspiration of the Spirit, as Saint Paul teaches (Cf. Romans 8:15). We must think: no one can call Him “Father” without the inspiration of the Spirit. How many times there are people that say “Our Father,” but don’t know what they say. Because yes, He is the Father, but when you say “Father” do you feel He is Father, your Father, Father of humanity, Father of Jesus Christ? Do you have a relationship with this Father? When we pray the “Our Father,” we connect with the Father who loves us, but it’s the Spirit that gives us this connection, this sentiment of being children of God. What better prayer, than that taught by Jesus, can dispose us to sacramental Communion with Him? In addition to being prayed in the Mass, the “Our Father” is prayed in the morning and in the evening, in Lauds and in Vespers; in this way, the filial attitude to God and of fraternity with our neighbour contribute to give a Christian form to our days. In the Lord’s Prayer – in the “Our Father” — we ask for our “daily bread,” in which we make a particular reference to the Eucharistic Bread, of which we are in need to live as children of God. We also implore “the forgiveness of our trespasses,” and to be worthy to receive God’s forgiveness, we commit ourselves to forgive those that have offended us. And this isn’t easy; it’s a grace we must request: “Lord, teach me to forgive as you have forgiven me.” It’s a grace. We can’t <forgive> with our own strength; to forgive is a grace of the Holy Spirit. So, while we open our heart to God, the “Our Father” disposes us also to fraternal love. Finally, we also ask God to “deliver us from evil,” which separates us from Him and divides us from our brothers. We understand well that these are very apt requests to prepare us for Holy Communion [Cf. Ordinamento Generale del Messale Romano, (OGMR), 81]. In fact, what we request in the “Our Father,” is prolonged by the prayer of the priest who, in the name of all, prays: “Deliver us, O Lord, from all evils and grant peace in our days.” And then it receives a sort of seal in the rite of peace: invoked from Christ first of all is the gift of his peace (Cf. John 14:27)) – so different from that of the world – it makes the Church grow in unity and in peace, according to His will; then, with the concrete gesture exchanged between us, we express “ecclesial communion and mutual love before communing with the Sacrament” (OGMR, 82). In the Roman Rite the exchange of the sign of peace, placed since antiquity before Communion, is ordered to Eucharistic Communion. According to Saint Paul’s admonition, it’s not possible to commune with the one Bread, which renders us one Body in Christ, without recognizing ourselves pacified by fraternal love (Cf. 1 Corinthians 10:16-17; 11:29). The peace of Christ can’t root itself in a heart incapable of living fraternity and of recomposing it after having wounded it. The Lord gives peace; He gives us the grace to forgive those that have offended us. The gesture of peace is followed by the breaking of the Bread, which since apostolic times has given the name to the entire celebration of the Eucharist (Cf. OGMR, 83; Catechism of the Catholic Church, 1329). Carried out by Jesus during the Last Supper, the breaking of the Bread is the revealing gesture that enabled the disciples to recognize Him after His Resurrection. We recall the disciples of Emmaus who, speaking of the encounter with the Risen One, recount “how they recognized Him in the breaking of the bread” (Cf. Luke 24:30-31.35). The breaking of the Eucharistic Bread is accompanied by the invocation of the “Lamb of God,” figure with which John the Baptist indicated Jesus “He who takes away the sin of the world” (John 1:29). The biblical image of the lamb speaks of the Redemption (Cf. Exodus 12:1-14; Isaiah 53:7; 1 Peter 1:19; Revelation 7:14). In the Eucharistic Bread, broken for the life of the world, the praying assembly recognizes the true Lamb of God, namely, Christ the Redeemer, and begs Him: “Have mercy on us . . . grant us peace.” “Have mercy on us,” “grant us peace” are invocations that, from the “Our Father” prayer to the breaking of the Bread, help us to dispose our spirit to take part in the Eucharistic feast, source of communion with God and with brothers. Let us not forget the great prayer: that which Jesus taught, and which is the prayer with which He prayed to the Father. And this prayer prepares us for Communion. A warm welcome goes to the Italian-speaking faithful. I’m happy to receive the Daughters of Mary Help of Christians; the parish groups, in particular those of Castellaneta, accompanied by the Bishop, Monsignor Claudio Maniago, of Bitritto and of Mesagne. I hope that for you all the visit to the Eternal City becomes an occasion to rediscover the faith and to grow in charity. I greet the school institutes; the former Salesian pupils of Livorno and the Group of the “Livio Tempesta” Prize for Goodness in school, hoping that you will be able to pick up the many positive examples and to finalize formative efforts to generous service of the common good. A special thought goes to young people, the sick and newlyweds. Dear friends, Christ has promised to remain always with us and He manifests His presence in many ways. Up to each one is the responsible and courageous task to proclaim and witness His love, which sustains us in every occasion of life. Don’t tire, therefore, of entrusting yourselves to Christ and of spreading His Gospel everywhere.